In accounting and finance, fundamental analysis is a method of assessing the intrinsic valueIntrinsic ValueThe intrinsic value of a business (or any investment security) is the present value of all expected future cash flows, discounted at the appropriate discount rate. Unlike relative forms of valuation that look at comparable companies, intrinsic valuation looks only at the inherent value of a business on its own. of a security by analyzing various macroeconomic and microeconomic factors. The ultimate goal of fundamental analysis is to quantify the intrinsic value of a security.Marketable SecuritiesMarketable securities are unrestricted short-term financial instruments that are issued either for equity securities or for debt securities of a publicly listed company. The issuing company creates these instruments for the express purpose of raising funds to further finance business activities and expansion. Its intrinsic value can then be compared to its current market price to help with investment decisions. Unlike technical analysis that concentrates on forecasting a security’s price movements, fundamental analysis aims to determine the “correct price” (true value) of a security. By knowing the right price, an investor can make an informed investment decision. A security can be overvalued, undervalued, or fairly valued. 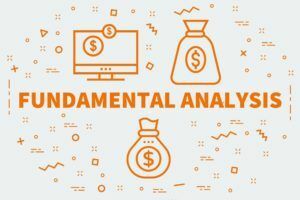 Fundamental analysis is an extremely comprehensive approach that requires a deep knowledge of accounting, finance, and economics. For instance, fundamental analysis requires the ability to read financial statements, an understanding of macroeconomic factors, and knowledge of valuation techniques. It primarily relies on public data, such as a company’s historical earnings and profit margins, to project future growth. Fundamental analysis can be either top-down or bottom-up. An investor who follows the top-down approach starts the analysis with the consideration of the health of the overall economy. By analyzing various macroeconomic factors such as interest ratesInterest RateAn interest rate refers to the amount charged by a lender to a borrower for any form of debt given, generally expressed as a percentage of the principal. The asset borrowed can be in the form of cash, large assets such as vehicle or building, or just consumer goods., inflation, and GDPGross Domestic Product (GDP)Gross domestic product (GDP) is a standard measure of a country’s economic health and an indicator of its standard of living. 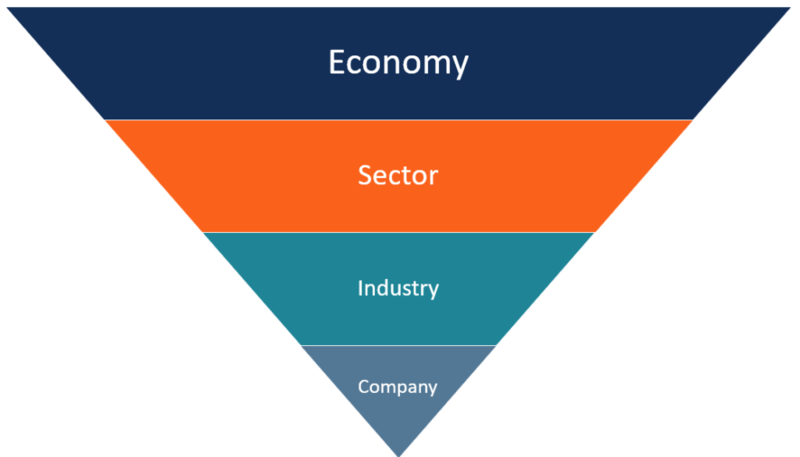 Also, GDP can help compare the levels, an investor tries to determine the overall direction of the economy and identifies the industries and sectors of the economy offering the best investment opportunities. Afterward, the investor assesses specific prospects and potential opportunities within the identified industries and sectors. Finally, they analyze and select individual stocks within the most promising industries. Alternatively, there is the bottom-up approach. Instead of starting the analysis from the larger scale, the bottom-up approach immediately dives into the analysis of individual stocks. The rationale of investors who follow the bottom-up approach is that individual stocks may perform much better than the overall industry. 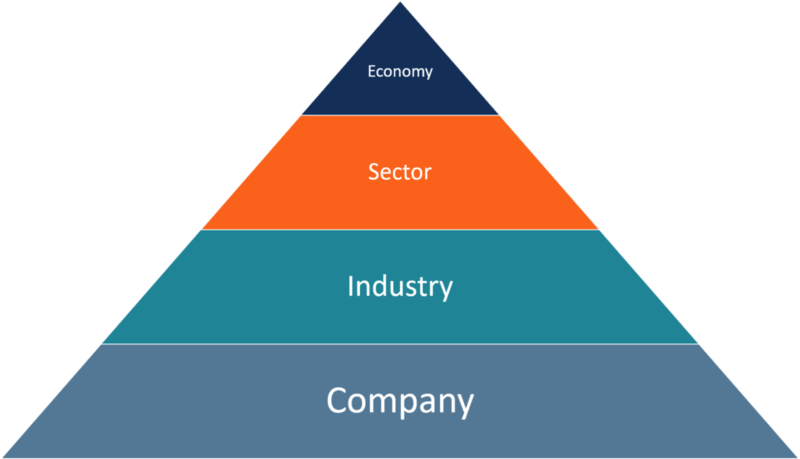 The bottom-up approach is primarily concentrated on various microeconomic factors such as a company’s earnings and financial metrics. Analysts who use such an approach develop a thorough assessment of each company to gain a better understanding of its operations.